Our fees listed below include reasonable labor timeframes for loading the truck or dumpster, clean up, and all your waste disposal expenses. Additional labor fees may apply for special projects and or long distances or stairs for loading our truck or dumpster. Our prices may further vary depending upon the weight of your junk and or debris which we are hauling and the prices of your specific county’s waste disposal fees. provides complete Customer Satisfaction in the highest quality by offering a complimentary broom sweep of the job area after the completion of each job if applicable. 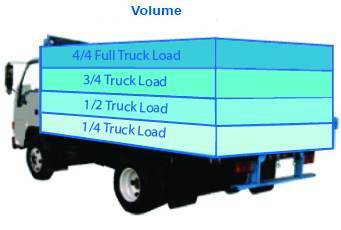 Truck/Dumpster Volume pricing for up to 17 Cubic Yards. Additional CY’s shall be charged as low as $32.00 per CY. charges for (clean, dry pre-excavated) Dirt at the rate of $145 per cubic yard; Concrete & Brick at the rate of $125 per cubic yard; Gravel & Sand at the rate of $145 per Cubic yard. If excavation is needed, we charge $165. and up per Cubic Yard. Roofing material, and other dense and very heavy materials are based on the bed load and additional weight which shall be determined by our drivers on site or as needed, but shall require additional weight fees. Additional labor charges shall apply for apartment dwellings, office buildings, and locations that involve unusually long trips to the truck, stairs, staircases, crawl spaces, dismantlement, demolition and or other labor intense situations and or projects. Terms & Conditions apply. 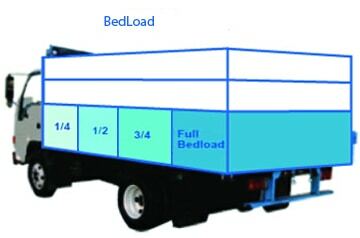 All transfer stations charge additional fees for mattresses, tires, etc…, which we pass along to you. Mattress fee $25. Tire fee $25-$125 depending upon size and if attached to rim. Hazardous materials such as paint, gasoline, batteries, fertilizers, cleaners, pesticides, herbicides, oils and anti-freeze, toxic chemicals, asbestos, unknown chemicals, oils, oil drums, and medical waste are all not accepted because of strict laws prohibiting us from doing so. Customers uncertain about the volume of junk or debris to be removed, can simply point to it or tag it while the crew remains working. Therefore, the final price will be given at the end of the job according to the volume of junk and how full our truck(s) or dumpster(s) are at the end of the job. Please note: Appointments must be cancelled at least 24 hours in advance and 4 hours if for same day booking. All missed appointments or late cancellations shall be charged a $250.00 fee. If you have ordered a dumpster, and wish to cancel, you must do so prior to our truck’s departure & or actual delivery, otherwise the entire rental fee shall be due. If you cancel your dumpster order after it has already been booked, a fee of $250 shall apply and due. If prior, no charge. Upon hire, You agree to ”DRC” and ALL our Terms & Conditions, which shall apply.